Rockstar provides some information on the game's availability, story, and gameplay in the hours leading up to its launch. Those of you who have already devoured all that Grand Theft Auto V has to offer and are eager for more won't have to wait too much longer. Rockstar has revealed via blog post that following a small title update, Grand Theft Auto Online will be made available for free to all owners of Grand Theft Auto V at 7AM ET on October 1. Furthermore, for those of you who are worried about spoiling the main GTA V story mode, worry not! Rockstar states that GTA Online takes place in the months leading up to the start of GTA V.
Rockstar also took the time to address some "griefing" concerns players may have. "In order to prevent some really annoying 'griefing', we've designed house party invitations specifically to be a friendly social affair where players can visit each other's pads without fear of having them ruined or losing their hard-earned vehicles in the process." Basically, if you invite someone into your house, they won't be able to shoot you up and steal your stuff. We also got a bit more info about the game's microtransactions that were unearthed the other week. Specifically, Rockstar stresses that it won't make the game feel like a "pay-to-win" affair. 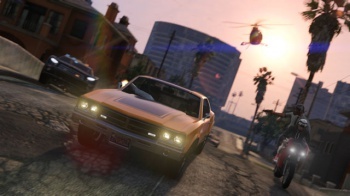 "To allay some concerns we've heard on this subject, we can assure you that the game is designed such that the option of purchasable GTA$ should not disrupt the playing field - and there are a few mechanics in place to help ensure that." The blog post also talks about the wide array of character customization options that will be available to players, and plans to continue supporting the game "in the coming months and years."